The Theme “Build a strong, healthy, life-giving, faith-filled marriage,” celebrates the profound effect the Creighton Model FertilityCareTM System has on marriage. Couples using the CrMS communicate regularly about their fertility and pregnancy-related intentions. Necessarily, they experience not only greater sexual freedom but deeper unity and intimacy as well. 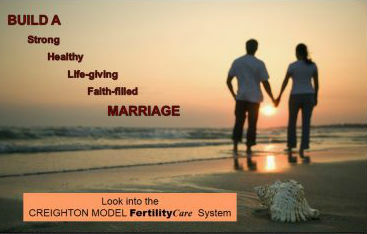 Would you like to learn more about the Creighton Model FertilityCareTM System? Do you want to know what you can do to get involved? Come learn with us! Contact our center and schedule a FREE 15 minutes consultation. NOTE: We offer Long-distance Teaching .